Originally published at Washington’s Blog, May 3, 2016. Thanks to Washington’s Blog for their continuing commitment to the truth on all fronts. The subject this story highlights is of profound concern at this site, particularly since awareness of its existence is being actively suppressed in mainstream corporate media. “Bisesar said she is innocent, and needs a “body scan,” not a psychiatric assessment. Many things fail to add up in the case of Rohinie Bisesar, the 40-year-old financial services professional with a highly accomplished resume who was recently charged with first-degree murder in Toronto in the tragic stabbing death of a young woman unknown to her, 28-year-old newly married Rosemary Junor, who, her family notes, “was just starting out on her life.” Rohinie Bisesar has been ordered to undergo a mental health exam in advance of an impending court date of May 4. We must question however whether mental health is the primary issue here, or if a darker scenario is at play. Described by former colleagues and classmates as “extremely gentle,” “brilliant,” and “calm,” she was also reported by some who encountered her closer to the time period of the fatal stabbing incident on Dec 11, 2015, as odd, according to reports. During this time she apparently exhibited what some called paranoia when she reported to friends on different occasions that her purse had been ransacked and her computer hacked into, and sought briefly at one time to obtain spy cameras to record suspected tampering by work colleagues of files and property at work, according to a former boyfriend. Delving into her background, as one reporter in Toronto Life has done, and many others reported, a rather desolate picture emerges of a highly educated professional who experienced continuous periods of unemployment and homelessness, yet who displayed remarkable resilience in continuing diligently, even seemingly obsessively, on a job search. With an MBA from highly-regarded York University, accolades from mentors and colleagues at York, where she interned and worked part-time during her studies, and financial analysis experience in respected consulting firms, she nonetheless faced inexplicable rejection in her job search on a continuous basis. Estranged somewhat from what sounds like an authoritarian family–hard-working immigrants from Guyana who ran a clothing store in Toronto–she relied on friends and colleagues for occasional handouts, a couch to sleep on, and other support. After a break-up with her boyfriend in 2014 when she returned briefly to her parents’ home, there was an incident of pushing her mother and damaging a door where her mother called the police. She was involuntarily hospitalized and forced to undergo a psychiatric evaluation–she was diagnosed with schizophrenia–and take an anti-psychotic drug, Olanzapine, which she found later to cause unshakeable drowsiness and mental fog, and stopped. During this time, she told her ex she had been hearing voices in her head since 2012, including the voice of “an old, white male Bay Street executive”. He felt he understood then all of the signs of “mania, paranoia, grandiose ambition” he had been seeing in her–through the lens of mental illness, it is implied. Notable here is a recollection from him of her asking him in spring of 2012 whether nanotechnology could control a person’s thoughts. Unlikely aspects of her engaging in sudden criminal aggression against another include the fact that she has no criminal record. After a visit at the jail where she is being held, her attorney, Calvin Barry, said she was “meek and quiet” and upset, he also noted she was like a “deer in the headlights,’ and a tiny person–four foot eleven, and weighing 85 lbs. These words have been repeatedly reported in the press as “bizarre” and evidence of mental illness. The word “bizarre” in fact has been used so often to color her claims that the question of Cognitive Containment, a military mind-hacking term described in Dr. Robert Duncan’s Project Soulcatcher, denoting the deliberate containment of ideas within pre-set contexts to limit the dissemination of awareness across populations, comes to mind. Predictably, all television channels reporting the in-court events that day, latched on to that word and echoed it non-stop. In court, her lawyer Calvin Barry spoke over her head, raising the specter of mental illness, and noting the need for a psychiatric assessment. In Canada, the finding of Not Criminally Responsible, while still a rare finding in court cases of homicide, can be administered in cases of mental incompetence. But there is another reason to investigate this case further, which could indeed also prove grounds for mitigation: that of covert neuro-experimentation, covert microchipping, and mind hacking by military/intelligence programs, a possibility which concerned citizens and activists from World CACH (World Coalition Against Covert Harassment) and US CACH (US Coalition Against Covert Harassment) have come forward to present as a possibility which must be explored further. Rohinie Bisesar’s claims in fact are not unusual today, they say, and are echoed by thousands who have experienced symptoms similar to hers. Citing recorded, scientifically-conducted scans of radio-frequency-emitting implants found in the brains of others reporting symptoms of external neural control of their brains, and pointing to reports of these scanning sessions conducted by the International Center Against Covert Technologies (ICAACT), they direct attention to a vast body of literature available online currently and in books and other media, detailing an ongoing worldwide occurrence of covert neuro-experimentation and covert micro-chipping, with many cases of reporting individuals surgically removing covertly-implanted microchips from their bodies. 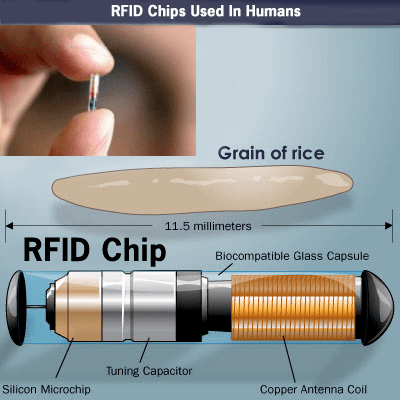 The Radio Frequency Identifying Tag (RFID) microchip industry today is a 10-billion dollar industry and growing. Ex-IBM Executive Patrick Redmond has stated that microchips are being used in retail, in agriculture, in health services, and newly in biometric surveillance, variously for tracking consumer items, cattle, and people. They range in size and form today from the visible RFID tracking chip now being used on credit cards, the tracking Verichip, twice the size of a grain of rice, to films, powders, disappearing inks. One class of microchip, the neurostimulator implant, is being tested, developed, and used in patients for various reasons, such as to administer controlled doses of medication internally. Microchips in their most basic form carry a transponder in them, a mechanism for receiving radio frequencies, and for emitting radio frequencies. Some are inert or passive unless stimulated by an external signal; some are active in continuously emitting a signal. The radio waves emitted and received can vary in length, based on frequency; some microchips developed by Siemens and other companies are known to be trackable from space (from over 75 miles or 400,000 feet away). Individuals often correlate these incidents of external activation to the close presence of people pointing cell phones at them. Many also note the experience of signals on their bodies directed at them from a cell antenna or cell tower–a phenomenon recently corroborated by senior ex-DARPA scientist Paul Batcho, who disclosed that a certain range of frequencies had been appropriated for exclusive use by the military, and was now being used to send specific frequencies to assault “targeted individuals” who have been made the unfortunate subjects of these illegitimate military/intelligence covert experiments and operations. In fact, reports of non-consensual neuro-experimentation abound, with many reporting sensations of feeling repeatedly remotely accessed around various regions of their head, experiencing constant ringing or tinnitus in ears, sharp localized pains to certain regions of their brains, sudden onset and surcease of strong emotions, as if externally induced, sudden onset of untoward thoughts, as if externally induced, strange dreams, as if externally-induced, the electronic play of voices inside their heads, often issuing directives in repetitious fashion, and “cloned” sensations of smell, hearing, touch, taste, and sight, meaning experiencing strong sensations of smell and touch or auditory or visual images, when no physical correlate for these sensations exists, as if specific parts of their brain, stimulated, had produced these sensations and images. In other accounts, individuals report the experience of suddenly having no control over their voluntary bodily functions, such as in moving their arms or legs, in speaking, or in controlling urination/excretion, and feeling accessed biologically remotely in directive ways. Authors Tana Winkler (My Remote Neural Monitoring Experience) and Tyrone Dew (The Illuminati Got Me! Directed Energy Weapon Terrorism) have both recounted experiences of this robotizing nature in their books. People have also reported externally-arising sensations of sexual stimulation and assault, and experiences of electromuscular shock on different parts of their bodies. In the more public world of mainstream television, we have all witnessed anchors around the world, including Judge Judy, suddenly lose control of their speaking faculties and issue forth disjointed streams of incomprehensible gibberish. What all of this points to is the remote access of human brains and the remote biological manipulation of human bodies. Are these entirely covert programs of experimentation by our military and Intelligence agencies? Or do patents exist in the public domain for some of these purported technologies? It turns out they do. Patents and military contracts exist, among others, for the remote access, harvesting, and manipulation of human brain waves, for altering brain states, for deep brain stimulation, for transcranial magnetic stimulation, for brain entrainment, for the electromagnetic disruption of neural networks and processes. Whistleblowing scientists have come forward to reveal their part in developing some of these technologies. Dr. Richard Alan Miller has recounted working for the US Navy and developing Synthetic Telepathy, also known as Voice to Skull or Voice of God or Microwave Hearing technology, where voice signals are modulated onto microwaves and transmitted into the back of a person’s head, inducing within his or her brain the clear auditory sensation of externally-produced voices, in a phenomenon of hearing voices inside one’s head which psychiatrists may unknowingly or knowingly mis-diagnose as a symptom of schizophrenia. Dr. Robert Duncan has come forward to describe DOD/CIA projects in cybernetic mind-control, weaponized neuropsychology, and bio-communication controls, which include the integrated use of Artificial Intelligence, biophysics, and behavioral science in the creation of remote-control Electronic Brain Links, cerebral cortex cloning, Mind Hiving, Neural Linguistic Programming. and more. Dr. Barrie Trower has spoken extensively of microwave radiation weaponry that has been developed by the UK Navy, for whom he has worked. This is, we are told, by a President sinking most of his budget in Defense, and $50 million of a $100 million investment in the BRAIN (Brain Research Through Advancing Innovative Neurotechnologies) Initiative in DARPA, the Decade of the Brain. Mainstream Neuroscience has also made astonishing, if not terrifying advances. Neuroscientists outside the military/Intelligence world, from academia and clinical practice, have started to speak openly about the remote accessing of people’s brains, of Neural Imaging wherein everything a person sees, whether physically or electronically, off a screen, can be picked up remotely (as EMF/low frequency radio waves) and reproduced/re-translated into image format via the intermediate use of a computer program functioning as an Electronic Brain Link. Similarly, technologies exist to pick up and record thoughts, ideas, memories–all issuing forth as extremely low frequency (and long wavelength) radiation, in the range of 0.5 to 30 Hertz–even the “voice in your head/your inner voice” can be read now, as pre-vocalized thought. Applications in Neurocrime and Predictive Policing–reading your mind to find out if you are a likely criminal or plotting a criminal act–very much in Minority Report style–are currently being studied, discussed at conferences, and discoursed about in Neuroscience programs. This Youtube playlist collects many related videos, including the Davos 2016 videos, on current-day neuroethics and neuroscience. Ongoing and recent DARPA contracts seem to be probing the myriad ways that military neuroscientists, neuropsychologists, behavioral scientists, cyberneticists, transhumanists, and Artificial Intelligence programmers can use to disrupt, alter, modify, transform, transhumanize (with nanotechnology introduced into neural networks), retard, and deform the human brain. These are not exaggerations. This is weaponized neuroscience, and the intent is Control of the Human Mind. While Universities make weak attempts to discuss neuroethics, the military has no such qualms and rushes in where academics might otherwise fear to tread. (Many Universities are currently receiving Defense funding and working on projects for the military, including in Neuroscience.) Projects include the disruption of normal narrative processes of sequential thinking, brain-computer interfaces via implants to control thoughts and feelings, and others. These are DARPA’s public-domain contracts. The DoD has a dark(er) side: the Black Budget, Covert Ops. What manner of experiments, of operations, of intentions exist here, do you think? It is theorized by some that the Black Budget is vast and capacious, runs up to trillions of dollars, and because it is classified, is able to run all sorts of dubious experimental operations on humanity, with zero accountability. These would be Covert Operations–including covert microchipping and covert neuro-experimentation–of the kind that thousands worldwide are reporting today, including in Canada and the USA. So Should the Criminal Justice System Rely Today Solely on Psychiatry–or Start Including Neuroscience? Given these current realities of Neuro-Experimentation on vast numbers of people, where should we place psychiatry today in the courtroom? To this day, psychiatrists often function as experts, swooping in to mark a person psychiatrically ill or mentally competent, as the case may be. They are seen as ultimate authorities in determining mental soundness, mental fitness. On their word, whole futures revolve. In a murder trial, this might well mean the difference between life and death for someone facing conviction. But someone reporting hearing voices in their head today, or suspecting the presence of a microchip somewhere on their bodies, or feeling they have been directed or steered toward an action foreign to their very character and core, as Rohinie Bisesar contends, can perhaps no longer be arbitrarily and unequivocally seen as mentally ill. All her claims: of feeling her senses have been taken over, of experiencing forced speech, and of having aspects of herself removed, of hearing voices in her head, and particular voices at that, are described as cerebral cortex cloning and synthetic telepathy experimentation projects in DOD/CIA-derived information in Project Soulcatcher. So we must conclude there could very well be a Neuroscience Experimentation component here, that cannot be ignored until it is fully investigated. One more factor of note must be considered. The US has a long history of covert experimentation on non-consenting citizens, and so does Canada. Canada was in fact part of the CIA’s MK ULTRA experiments; some of the most egregious radiation experiments were conducted on children at Canada’s McGill University. One discovered motive in trauma-based mind control experiments under MK ULTRA was the CIA’s interest in creating sleeper assassins or Manchurian candidates–people who would be steered toward committing assassinations for the state, even if their base personality would prevent such actions. They could literally be split multiply into multiple personalities–some aspects of them lifted and removed, some aspects moved in, some small, some large, as Rohinie Bisesar put it–so their new, altered self could engage in actions of violence abhorrent to their own, earlier self. In the case of Rohinie Bisesar, two young women have abruptly lost their lives and futures. Rosemary Junor was tragically stabbed to death (although she survived the incident, she died in hospital a few days later). Rohinie Bisesar allegedly did the stabbing, and quite possibly faces life in prison. Although Miriam Carey–who was shot by the Secret Service at the Capitol after a chase succeeding her crashing a barrier near the White House with her car (with her 1-year-old child in the backseat)–and Aaron Alexis, the Navy Yard shooter, who shot several, and Myron May, the Florida State University shooter and ex-District Attorney, who shot many (with both killed by police), were all three deemed mentally ill and schizophrenic for having reported hearing voices in their heads, signs exist to suggest that all three were non-consensual subjects of covert neuro-experimentation instead. Aaron Alexis had in fact complained of ELF radiation attacks and had inscribed on his rifle the words “My ELF Weapon.” Myron May had also complained of hearing voices through walls, and being covertly assaulted with directed-energy weapons. Miriam Carey had said Barack Obama had spoken to her inside her head; among other patents noted above, the technology exists to accurately “clone” anyone’s voice. Mass shootings in our midst these days often seem to point to manufactured false flag events, with the objective being gun control–perhaps Aaron Alexis and Myron May and Miriam Carey (attempted sleeper assassin?) fall into this category. What might be the objective though, in a case like Rohinie Bisesar’s? In the US, the government has given itself permission to engage in Psy Ops on the populace, and to engage in the dissemination of government propaganda, by Executive Order. The US has also signed and is implementing Global Policing agreements, where UN policing initiatives are superseding local ones. Is this the case also in Canada? In Rohinie Bisesar, we have a highly-educated, accomplished, and personable woman from the upper middle-class with a known personality of calm, focus, and gentleness, and no criminal record, supposedly sliding in adulthood into sudden mental illness, loss of control over her life, unexplained unemployment, and finally, violent “extremism” as she abruptly destroys her own life and career in a fit of unprovoked aggression in a drugstore, stabbing to eventual death a complete stranger, with a kitchen knife. Hearing voices, displaying paranoia, unable to find or keep employment, she is hustled off to psychiatrists, named schizophrenic, and prescribed neuroleptics to further retard her mental functioning. The narrative we are left with is that sudden onset of schizophrenia, “violent extremism,” and uncontrolled aggression can emanate from the most unlikely of sources, and can erupt at any unexpected time, even from among the ranks of the highly-educated, the highly-accomplished, the seemingly calm, gentle, and personable, and from any genre of citizenry, including the educated, hard-working Guyanese immigrant of South Asian descent. 3) To rationalize the extreme drive toward full-spectrum surveillance in the US and Canada and worldwide: surely we All need to be continuously monitored, chipped, tracked, and surveilled because, however educated or personable or non-criminal we are, any one of us could go off our rockers at any time in our lives, and launch hacking or stabbing or shooting incidents on our fellow-humans; “Countering Violent Extremism” with Predictive Policing and Community Policing could be on the menu to being rationalized in this way. 4) To valorize Policing, policing budgets, and innovative policing methods which are already beginning to include increasingly invasive forms of biometric surveillance–fingerprints, irises, gait, skull-shapes, face-structure, DNA–and bump those up via Neuroscience to brainprints (one’s signature set of EMFs emanating from our individual brains), heartprints, and so on. All these are signals of totalitarianism, and unless we as a society begin to openly and fully acknowledge and address the very real monsters in our midst of covert neuro-experimentation, covert micro-chipping, and covert assault with electronic/scalar/sonic neuroweaponry which thousands are reporting today–even as massive State-sponsored attempts to suppress public awareness of these atrocities rise, with a silenced/complicit corporate media and active publishing of disinformation online, as in Wikipedia and Rational Wiki–we condemn ourselves to continued manipulation, deception, and control en masse. Instead of mis-characterizing reports of remote mind control and neuro-chipping as “bizarre,” reporters with integrity could start investigating, researching, and reporting on Neuroscience experimentation, patents and contracts for remote read/write projects on brains, Neurocrime, and Predictive Policing. Attorneys and judges in the court system could get informed on the very real potential, via Deep Brain Stimulation, pulsed microwave induction, and radio-frequency cortex cloning of external neural influence of human thoughts, behavior, and actions. Psychiatrists and psychologists could get informed too, on Synthetic Telepathy, Deep Brain Stimulation, neurostimulator implants, HAARP’s abilities to effect mind-control via ELF (Extremely Low Frequency radiation), remote influencing of brains, and related subjects. All of society could wake up and demand that the sociopathic and eugenicist Neuro-experimentation and electronic harassment programs being run by the DOD/CIA and other Intel/Security agencies—the CIA/FBI/NSA/DIA/”shadow government” complex—under various covers of “national security” worldwide, as reported by whistleblowers, are stopped immediately, and the top Government perpetrators held accountable. Perhaps Rohinie Bisesar’s case is a wake-up call to all of us. This is no longer Kansas. It’s 2016, institutional ethics is on the wane, and stealth warfare is on the rise. Our brains are being studied, researched, remotely stimulated and influenced, remotely read, and remotely “written” or altered. If we don’t individually wake up now and collectively work to change our current reality, it is entirely possible we and our children–as independently thinking and acting humans, as sovereigns entitled to the sanctity and privacy of our thoughts— won’t have much of a future left, very soon. This entry was posted in Agenda 2030, Agenda 21, America, Artificial Intelligence, CIA MKULTRA, Clandestine, covert harassment, covert implants, covert surveillance, EMF Radiation/Sonic Neuroweapons, Fraud in Psychiatry, Global Governance, human experimentation, Human Subject Experimentation, Targeted Individuals, targeting individuals, Waking Up and tagged artificial intelligence, body scan, Calvin Barry, CIA, Covert Microchipping, Covert Neuro-Experimentation, DOD, electronic harassment, eugenics, hearing voices, implants, Mind Hacking, MK ULTRA, nanotechnology, New World Order, paranoia, Psychiatric Illness, Rohini Bisesar, Rohinie Bisesar, Rosemary Junor, stabbing, stealth warfare, synthetic telepathy, Toronto, Washington's Blog. Bookmark the permalink. Lucifer runs this planet. Plain and simple. she was definitely working on something big and was getting to close to the truth and probably might not have even known it=–purse ransacked and other stuff—wheres the RCMP or OPP to investigate???? A Toronto MK-ULTRA whistleblower M. Pauly recently spoke about Rohinie Bisesar’s case, see https://youtu.be/qq4MItxp0yU?t=3940 If you view the entire presentation you will learn that MK-ULTRA R&D that happened in Montreal in the 1950s-60s continues in a covert form in at least Toronto. Several recent ‘fear’ events in Canada since 2014 have significant signs of MK-ULTRA mind-control.